NEW YEAR! NEW GAMES! NEW WORKSHOPS! 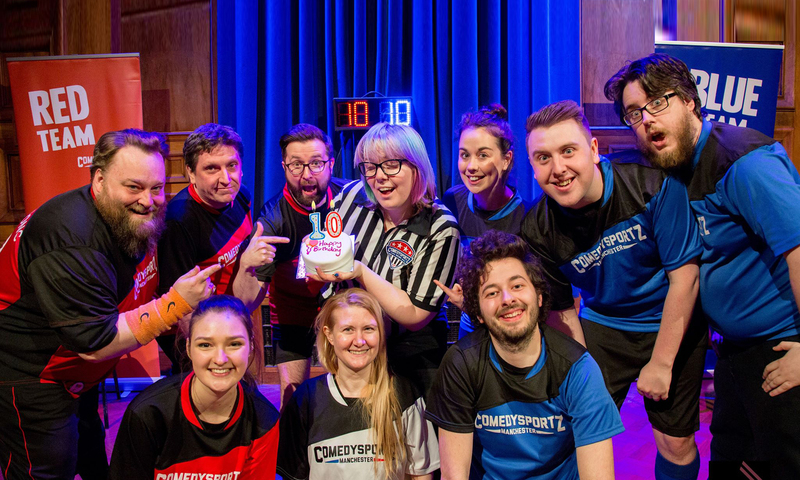 Happy New Year from all of us at ComedySportz UK! It’s only a few weeks until our first shows and workshops of 2018 (and all on one day too) and we hope to see you there! We finished 2017 with a sold-out Saturday of Improvised pantomimes and can’t wait to bring that show back bigger and better later this year. We were also featured by the Guardian in a great piece about the benefits of Improv Workshops on mental health. We’re delighted that our workshops have had such a positive effect on so many people, whatever their reasons for taking a course. Workshops have a real benefit on those that take them. We’re back at Waterside Arts 20th January with our now traditional New Year, New Games special as we try out a few new games as well as playing a few fan favourites. Earlier in the day we also have our first ComedySportz 4 Tots show with more BIG laughs for little kids. The week after we’re back at Ramsbottom Civic Hall for more all ages, all action, all improvised competitive comedy shenanigans! Anyone with a GENUINE mullet gets in free. Improv Mullet is moving to The Kings Arms in February to replace Let’s See What Happens. It’s a show that combines the best of our shortform and longform comedy shows and we hope to build the show over the course of the year. To help promote the show, anyone with a GENUINE mullet gets in for free! Our workshops in Improv, Stand Up and Sketch Writing return this month as well. If you made a new years resolution to laugh more, to play more, to build confidence, learn new skills that can be used both on and off stage, sharpen your comedic voice, brush up on those presentation skills or just to make new friends then we have workshops for you! Spaces are filling up fast so be sure to visit our workshops page for more information today. Whatever your reason for taking a class with us you’ll receive expert tutelage and have plenty of fun along the way! We’ve got plenty planned for 2018 and can’t wait to share it all with you!